If this image looks strangely familiar, you may be a Doctor Who fan. If you are also hoping there is a log book to sign, you may be a whovian geocacher. You'd also be in luck. It is really fun when several of your interests converge in an awesome package, and this first stop hit several of mine. Little Free Libraries have a special place in my heart. They are, essentially, boxes placed in neighbourhoods on private property where anyone can come "take a book, leave a book". I've done a Little Free Library cache before, so I was stoked to find another one. The fact that it was Doctor Who themed made it an instant must-find for our trip. 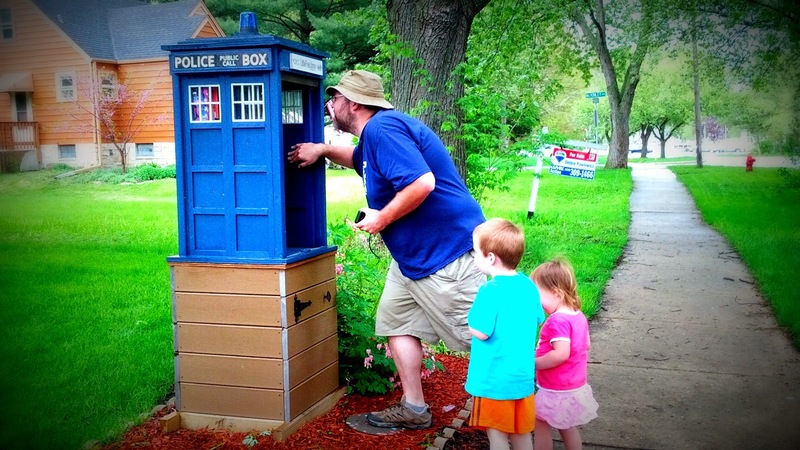 This Little Free Library, made up like a TARDIS, is in the front yard of a private residence in Lisle Illinois. We pulled up just after a rain storm at 4:30PM, after driving all day. When we saw the box we all jumped out of the Geovan of Destiny, excited to take a closer look. The library has 3 shelves of books inside. The top two are full of novels, and the bottom is full of kids picture books. I happen to keep a set of novels in the van in case I come across a book exchange cache (that is normal, right? ), so I was prepared to swap some books. After examining all the options, I let the kids pick one story each. They were stoked to get them. The quality of the construction is good. Really, really good (puts my TARDIS cache to shame, and I thought mine was already pretty decent). Aside from being half size of the original, I would swear its an accurate representation. There is, of course, a geocache in the TARDIS in a "secret compartment", tho it really is a quick find (even I could do it). Truth be told, this is likely one of the coolest geocaches I have seen to date (and I have seem some really cool caches in my time). If you are in the area, I highly recommend checking out "Full of Wibbly Wobbly, Timey Wimey Stuff" (GC4R1TF) for yourself. You won't regret it.